Package prices on contract. I am offering some rentals to our couples as added value savings. Mainly because I've seen some shabby looking unsturdy arches on the beach that people have brought not realizing you need heavy duty on a beach . I've even seen a couple of very unpleasant things come from some local florist shops! We decorate with neutral colors but will add touches of your wedding flower color if you wish. Our bamboo is nice size in diameter and looks professional. It has been properly treated to retain its nice finish. It's properly stored in the winter to prevent splitting and color decay. My white arch is also properly maintained and secured well on windy beach. Includes set up and removal. White arch. Colors to coordinate with your flowers, or plain and you may decorate. You may mix and match items at a special price just for you. Set up completed aprox. 1/2 hour before and removed with in 30 minutes after ceremony completion. Speaker -Not Pictured - 10in . battery operated professional beach speaker with inputs for microphones and cord for pre-recorded music device. $30.00. When you are not having a live musician , I recommend this speaker for beach weddings as music often dissipates in the vast openess of the beach and surf sounds. 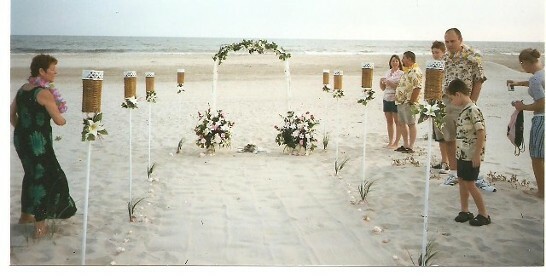 Includes : Ceremony performance , Decorated rental Arch with 2 palm plants, unity sand or candle . 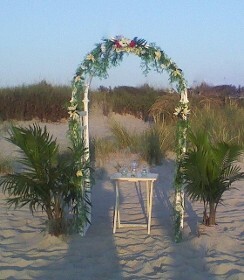 White arch with touches of your color 2 Palms and use of unity table. The bamboo has been properly treated to retain the natural golden finish. 3 pole Bamboo Arch with deco as seen above. See contract for tiki torches etc. 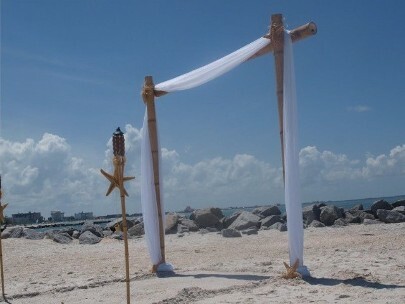 Tiki torches used are pictured with white arch above now have starfish on them as well. 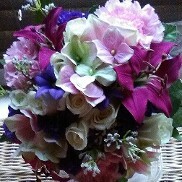 $85.00- Bouquet and groom lapel flower to coordinate with your color choice . Flowers in season . Styles vary. 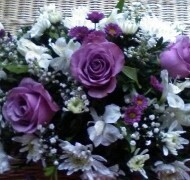 All with ribbon wrapped stems. Upgrades optional. Maid of honor and best man additional. Bouquet pictured below is in an oasis holder for small extra fee.